This class consists of TOYO MARU No. 3 only, completed in Oct ‘25 for Sawayama Kisen K.K. She was requisitioned by the IJN in Nov ’41 and converted in Dec ’41 to an auxiliary netlayer. 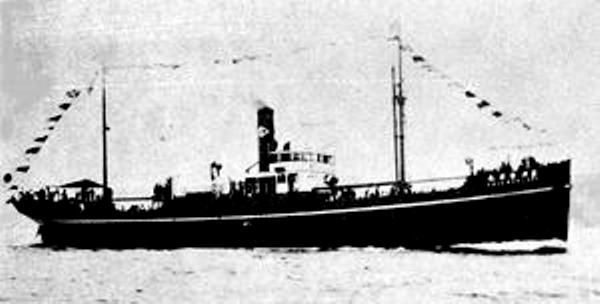 TOYO MARU No. 3 was re-rated as an auxiliary transport in Oct ’43. She ran aground in Jun ’45 and was subsequently bombed and damaged beyond repair by US carrier-based aircraft. Builder and Year Completed: Kobe. Harima Zosen K.K.. Propulsion: One reciprocating triple expansion steam engine, one shaft, 910 b.h.p. Speed: Cruising: 10 knots – Max: unknown. Armament: As netlayer (standard armament): One 8cm/40cal deck gun, one Type 93 13mm MG, one 7.7mm MG, one 60cm searchlight, one DC launcher, two DC racks, 24 DCs, four anti-torpedo nets, one hydrophone. - 22 Nov ’43: One 8cm/40cal deck gun, four Arisaka rifles, Type 3 handguns, Type 95 DCs. - 19 Mar ’44: One 8cm/40cal deck gun, one Type 93 13mm MG, four Arisaka rifles, Type 3 handguns, four Type 95 DCs. - 16 May ’44: One 8cm/40cal deck gun, one Type 93 13mm MG, four Arisaka rifles, Type 3 handguns, four Type 95 DCs, one Type 3 hydrophone. - 24 May ’44: One 8cm/40cal deck gun, one Type 93 13mm MG, four Arisaka rifles, Type 3 handguns, four Type 95 DCs, two DC racks with 6 DCs, one Type 3 hydrophone. - 30 Jul ’44: One 8cm/40cal deck gun, one Type 93 13mm MG, four Arisaka rifles, Type 3 handguns, one Type 95 DC, two DC racks with nine DCs, one Type 3 hydrophone. - 11 Aug ’44: One 8cm/40cal deck gun, three Type 93 13mm MGs, four Arisaka rifles, Type 3 handguns, one Type 95 DC, two DC racks with nine DCs, one Type 3 hydrophone. - 28 Oct ’44: One 8cm/40cal deck gun, three Type 93 13mm MGs, four Arisaka rifles, Type 3 handguns, four Type 2 DCs, two DC racks with six DCs, one Type 3 hydrophone. - 22 Nov ’44: One 8cm/40cal deck gun, three Type 93 13mm MGs, four Arisaka rifles, Type 3 handguns, two Type 2 DCs, two DC racks with eight DCs, one Type 3 hydrophone. - 30 Mar ’45: One 8cm/40cal deck gun, two Type 96 25mm guns, three Type 93 13mm MGs, four Arisaka rifles, Type 3 handguns, two Type 2 DCs, two DC racks with eight DCs, one Type 3 hydrophone.